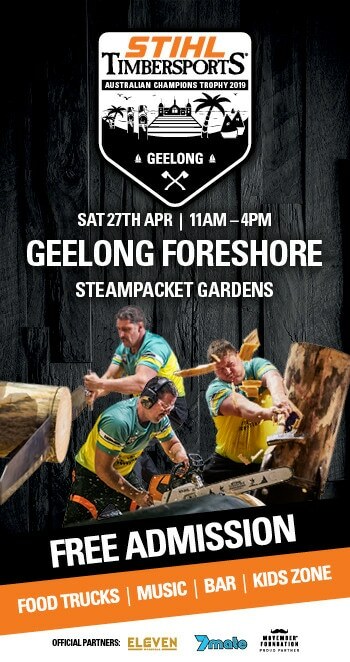 Grass Trimmer, Brushcutter or Clearing Saw? Brushcutters feature a straight drive shaft and a gearbox, so that more torque and power can reach the attachment that’s doing the cutting. 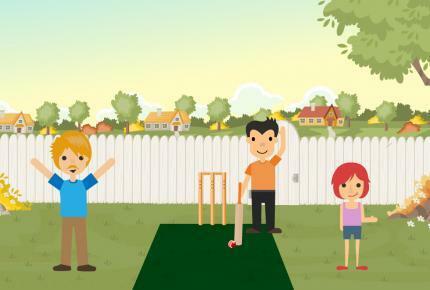 Grass trimmers do not feature a gearbox and have a direct drive shaft. They aren’t the best tool of choice for tackling large areas or areas with heavy growth, however are perfect for mowing grass and light weeds around the garden. Which tool to use when? Is the area safe to work in – look out for dangerous objects such as wire and rocks. Is the area safe to access? What type of vegetation needs cutting? How dense is the vegetation? If you do not feel that it’s safe to access and work in the area, then we recommend leaving this task to a professional, or seek advice before you get stuck in. If you’re comfortable that the area is safe to access and work in, it’s time to choose your weapon of choice. Remember to read the owner’s manual before getting started on any task. For light mowing around obstacles such as trees and fences, and for perfecting your edges, we recommend a mowing line head. 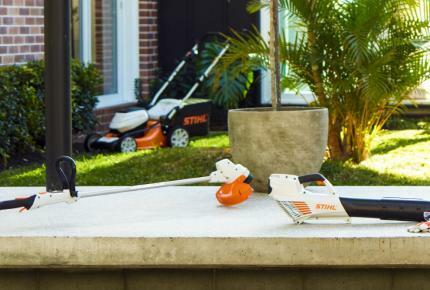 The most popular line head in the STIHL range for our brushcutters and grass trimmers is the STIHL AutoCut head. 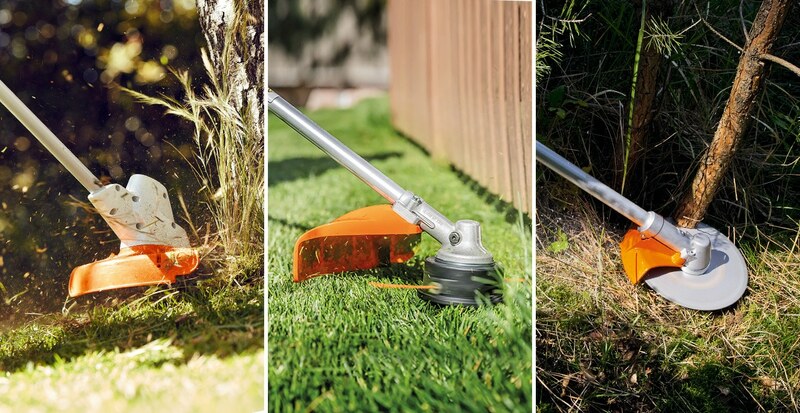 The AutoCut head is incredibly easy to use, and the ‘bump head’ feeds the mowing line out by quite literally bumping it on the ground, removing the hassle of manually feeding out the line by hand. Mowing line allows for more control and freedom when trimming grass, and gives a perfectly neat finish. When mowing against hard surfaces such as fences lines and tree trunks, be sure to leave enough distance between the two to avoid leaving marks or causing any damage. If you find your line is breaking very easily when mowing close to obstacles, storing it on water overnight will give it more flexibility. Mowing heads that can take a thicker line will do well on most grass types and dense weeds. However you’ll quickly learn if mowing line isn’t cutting it. 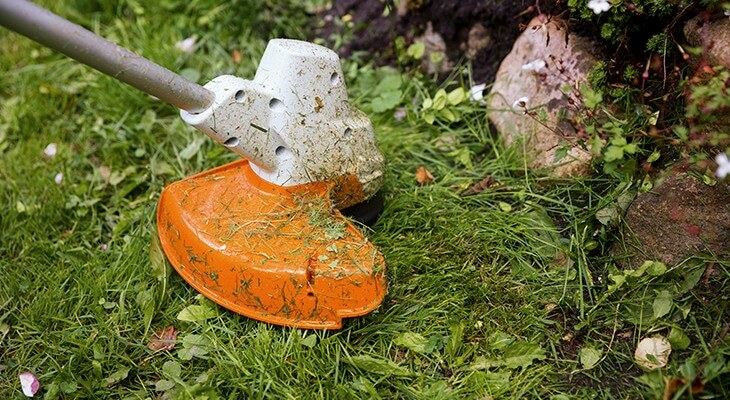 If you’re churning through more line than necessary, it might be worth considering a PolyCut or DuroCut head for your grass trimmer or brushcutter. A PolyCut head features three replaceable polymer blades that are designed to work in a similar way to a metal grass blade however with greater flexibility, especially where there are obstacles present. 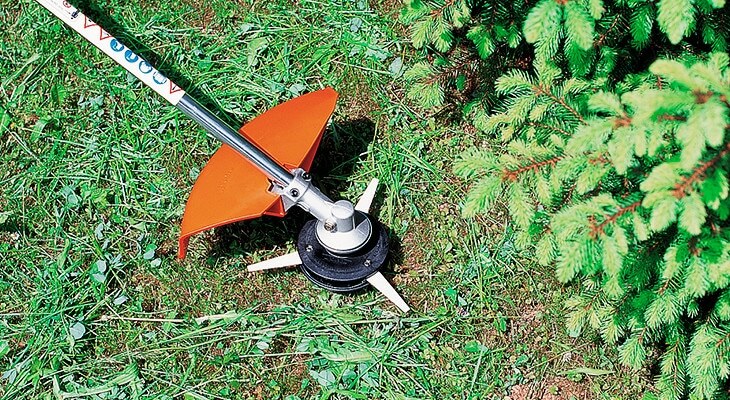 A DuroCut head runs serrated line pieces up to 4mm thick that are easy to replace and ideal for cutting through taller vegetation and woody species. 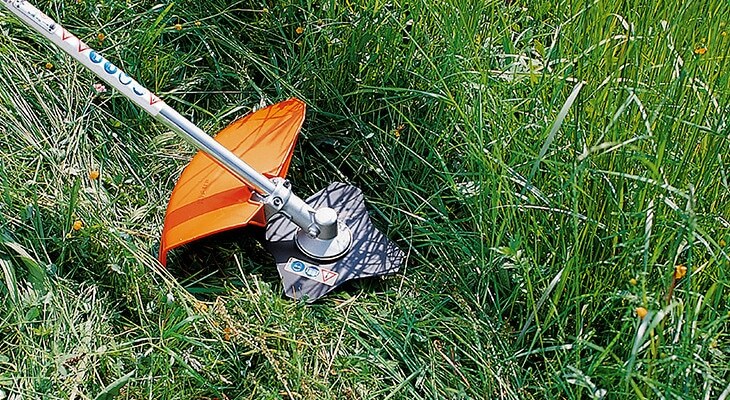 If you’re looking to tackle dense clusters of grass, paddocks or areas that feature a large concentration of weeds, it is worth considering metal grass cutting blades. There are multiple options available, offering two, four or multiple tooth varieties. The two and four toothed blades are the most popular, as they built to cope with a variety of green, heavy vegetation. The sharp edges allow the thicker stems to be cut instead of bludgeoned, resulting in a neat and quick finish. For long term use, we recommend using blades as they tend to vibrate less, making the task more comfortable for the user. It is important to be mindful of solid objects while using blades as they may kick out if they come into contact with something static. Be sure to check the recommend PPE to wear in the owner’s manual before use. 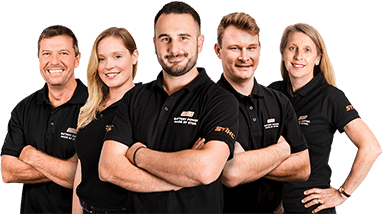 Your local STIHL dealer can advise the correct blade option for the task at hand, and can ensure proper fitment to the machine along with the ability to provide the correct guard to suit. This will ensure you have the right tool for the job, the advice on how to tackle it and most importantly, the correct measures in place to ensure you do the job safely. 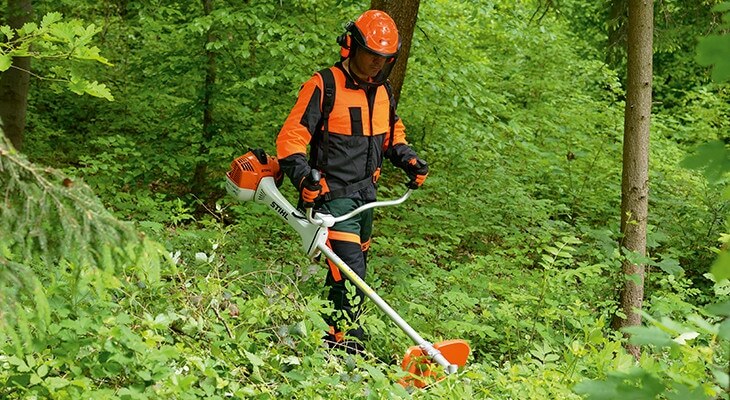 If you need to clear areas of thick and woody vegetation, it’s time to consider a more substantial cutting tool. To tackle tough, thick and unruly growth, brush knifes and shredder blades are your best option. Both of these attachments are designed to be used in a vertical motion, working from the waist downwards to remove the vegetation in stages. The greatest advantages of this is that the end result is a mulch like material, reducing its overall size. 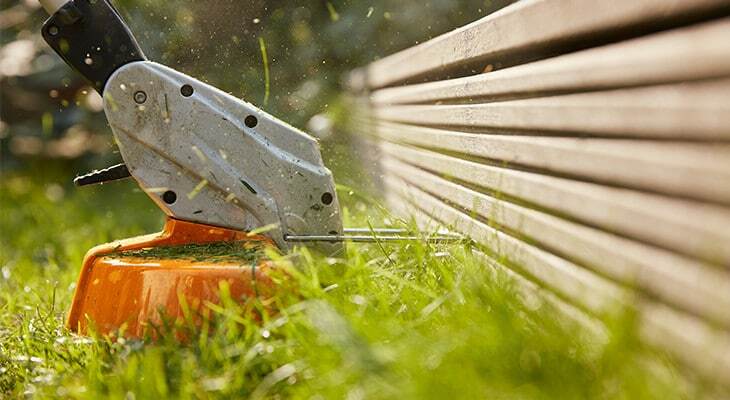 As with the grass cutting blades, please ensure you speak to your local STIHL Dealer about fitting the correct guard to suit the machine and blade options. Please note that shredder blades are to be fitted to the STIHL range of clearing saws with bike handles and appropriate guard only. You don’t always need to reach for the chainsaw when cutting thicker branches and thin trees. 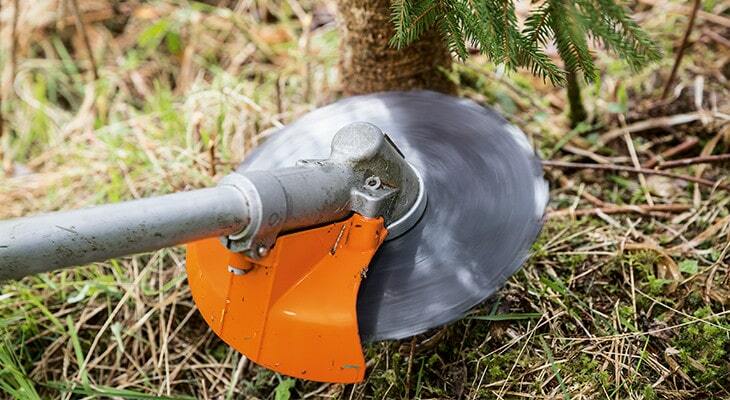 The right cutting tool on a brushcutter or clearing saw may be just as effective. Working in a similar way to a circular saw, the chisel tooth, scratcher tooth and carbide tipped saw blades are perfect for this kind of work, moving horizontally instead of vertically. Using a brushcutter or clearing saw instead of a chainsaw for small, thin trees and bushes also allows you to cut nice and close to the base, without having the bend down. This is a great option for thinning out large areas of mixed scrub and plantations. 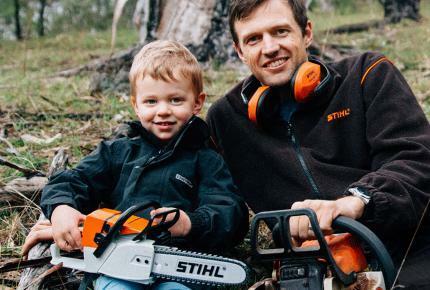 If you need advice on the tool that’s best suited to your task, visit your local STIHL Dealer.